I’ve been doing some research into prenatal yoga and specific asana modifications for pregnant women in preparation for possibly covering a few prenatal classes at my yoga studio. Pregnant women are my bread and butter, so to speak, in my “day job” so it would seem natural that I could teach prenatal yoga- blending my two passions. But, alas, I felt inadequate- so to the world wide web I turned. I will be posting a fun prenatal sequence soon, but I thought I’d share my favorite discovery… a propped up version of Savasana (corpse pose), nicknamed “Barco lounger”- so beautifully modeled below by Elli Soleil. It is, obviously, not just for the pregnant yogini. You will need some serious “propage”, though, so it may not be easy to take this version in every yoga class. But, I recommend you try it! I offered this variation to a private yoga client last night and she immediately said “Ooooh, I like this”. Place one yoga block horizontally on the highest setting towards the top of your mat. Then, lay another block below it on the lowest setting, vertically (in relation to the mat). Lay a bolster (or 2 folded, stacked blankets) on an incline across both blocks and set another bolster towards the bottom of the mat. 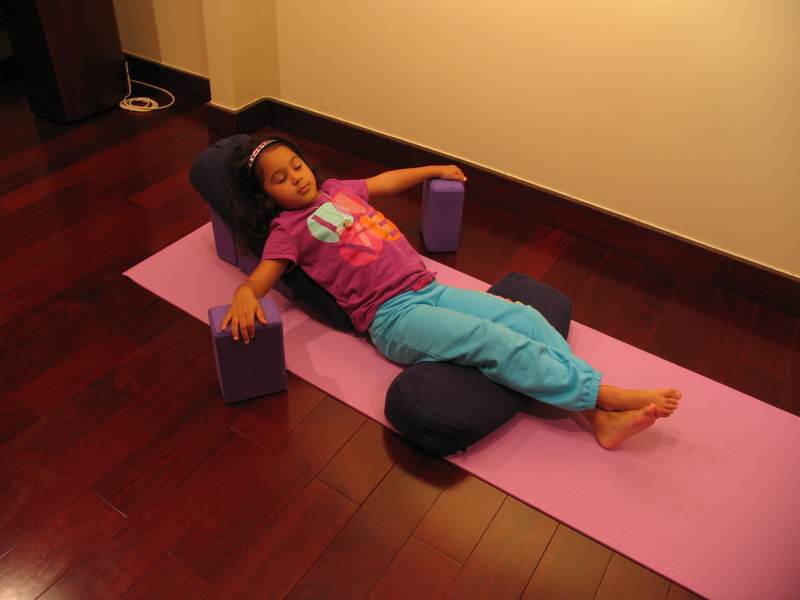 Step in and lay down bringing your hips right up against the inclined bolster and your knees on top of the flat bolster. If you have the luxury of more blocks, place two under your hands/arms (whichever is more comfortable). Close your eyes, breathe and enjoy! Savasana represents surrender of all things that are foreign to our soul. When we have completed our yoga practice and given it our best, it is time to let go. The moment has come for yoga nidra, the yogic sleep. It is not born out of tiredness and is instead a completely open state of mind and heart that invites the grace of unconditional love into our life…Death is the ultimate wake-up call. When it comes, we have to leave behind all we have accumulated. We come into this world with empty hands, and we must leave with empty hands. Being conscious of death in a yogic way does not turn us into curmudgeons, but instead allows us to live every moment in freedom and joy.